University research has provided us with the What and the Why in brain sciences. We've translated that, added 23 years of experience, and created the How. 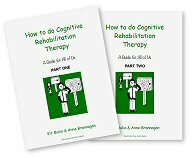 The How to do Cognitive Rehabilitation books, Parts One and Two, provide an easy-to-read, practical guide for everyone. You don't need to digest this book from front to cover - you can simply dip in to find an answer to a specific problem. You don't need to be an academic to understand the brain and cognition - you'll easily grasp our straightforward, no-dictionary-needed approach. Book One summarizes the What and Why of cognitive rehabilitation therapy and provides a solid foundation for treatment approaches. Book Two provides the specific "How To" for providing cognitive rehabilitation. The major treatment areas are covered in Book Two: attention, visual processing, information processing, memory, and executive functions. Meant for professionals, individuals with brain injury, their caregivers, and family members, this is our most user-friendly material available. We know you're busy and have a lot on your mind. We're confident that our easy-to-read books will provide you with an excellent guide to managing your cognitive rehabilitation therapy program. With this book, Malia and Brannagan are successful in their goal to have a beneficial effect on clinical practice that is immediate and pertinent. They provide a road map of cognitive rehabilitation with their pragmatic, accessible and theoretically grounded approach to working with people who have cognitive impairments. This workbook allows clinicians to navigate the clinically complex practice of cognitive rehabilitation using consistent principles and guidelines. These are exceptional books that provide practical and effective tools to help people succeed in daily life and to build long-term opportunities. Kit Malia and Anne Brannagan are accomplished clinicians whose experience and compassion come through loud and clear. The combination of concise and witty text, real world examples, and illustrations literally make these a joy to read. Kit Malia and Anne Brannagan realized a long time ago that the cognitive functioning of the people they served was central in the day-to-day success of individuals' with brain injuries. Yet, cognitive rehabilitation therapy (CRT) was difficult to access and often difficult to deliver without practical, hands on interventions that directly related to a person's real-life needs. In their two manuals on How to do Cognitive Rehabilitation Therapy, the authors have conceptualized a model for CRT that provides treatment strategies that can be generalized into everyday settings, including home, work and community. Easy to read and understand, both manuals present wonderful examples and exercises that can be used by professionals providing CRT services to individuals with brain injuries.